Take 100g of organic butter and heat it to around 60 degrees Centigrade. Turn off the heat and stir in the finely chopped seaweed: leave to infuse for an hour. While the seaweed butter is infusing, clean and trim the samphires (see the note below) then set them aside. Take half the remaining butter and cook off the fish in a non-stick pan. In a separate skillet, use the rest of the butter to sweat the samphires gently, taking care not to overcook them. Drain them in a small colander and start plating up immediately. Heat the seaweed butter and stir in the chives, parsley and grated lemon zest. 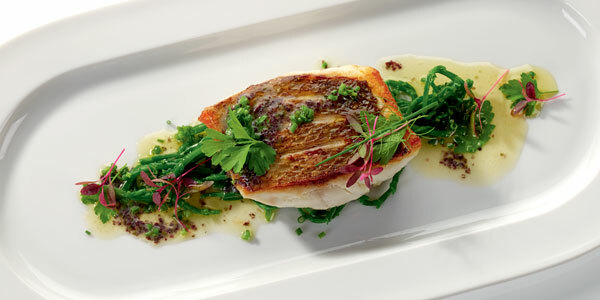 Plate up the hot fish pieces and top them with the seaweed butter mix adding the samphires as a garnish.